Three weeks ago, REDD-Monitor wrote about Global Forest Watch, an online forest monitoring system run by World Resources Institute and more than 40 partners. The tool provides a huge amount of information about the world’s forests, including deforestation, protected areas, biodiversity hotspots, mining, logging, palm oil and wood-fibre plantations. We have all heard the phrase: “you cannot manage what you cannot measure.” By the time we find out where, when, and why deforestation is taking place, the opportunity for action has often passed. It can take years to collect, analyze, and publish data urgently needed by those who manage forests and invest in forest protection. The lack of precise and consistent data on forests also presents a key barrier to realizing a global-scale, performance-based mechanism for reducing emissions from deforestation and forest degradation (commonly known as REDD+). The newly launched Global Forest Watch, an initiative of the World Resources Institute and over 40 partners, aims to tackle the forest information problem by dramatically reducing the wait for reliable forest data. Anyone with an internet connection can now access easy-to-understand information about where forests are disappearing and re-growing worldwide, with spatial resolution of up to 30 meters and updates as frequent as every 16 days. This information can be used by governments to target law enforcement efforts, by NGOs to campaign for better forest protection, and by companies to monitor deforestation in their operations and supply chains. Despite these advances, we have only scratched the surface of the forest information problem. There are a number of obstacles standing in the way of our vision to ensure universal access to high-quality and useful information about forest landscapes. The Global Forest Watch team is seeking partners and collaborators who can help us overcome these challenges. 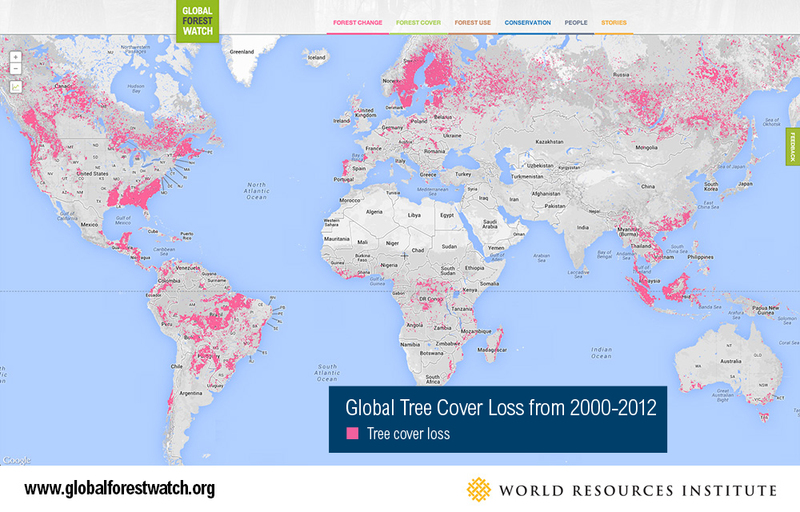 A screenshot from Global Forest Watch showing a global dataset on tree cover loss from the University of Maryland. The data goes down to 30 meter resolution, fine enough to see change in even extremely small plots of forest. Varying definitions of “forest” and “deforestation” among other terms make it difficult to generate consistent and comparable data at a global scale. A commonly cited definition provided by the United Nations Food and Agriculture Organization (FAO) describes forests as “land spanning more than 0.5 hectares with trees higher than 5 meters and canopy cover of more than 10 percent.” On the other hand, Global Forest Watch avoids defining forest altogether and provides near-real-time data on “tree cover loss” instead. Neither approach distinguishes tree plantations from natural forests, which limits the practical applications of the data. Even in the context of natural forests, multiple different types of forest exist, each with different values for biodiversity protection, carbon storage, and ecosystem service provision. GFW is currently working to address this issue by working with partners to create new datasets showing the location of plantations, but we still need better information about the types and status of forests around the world. 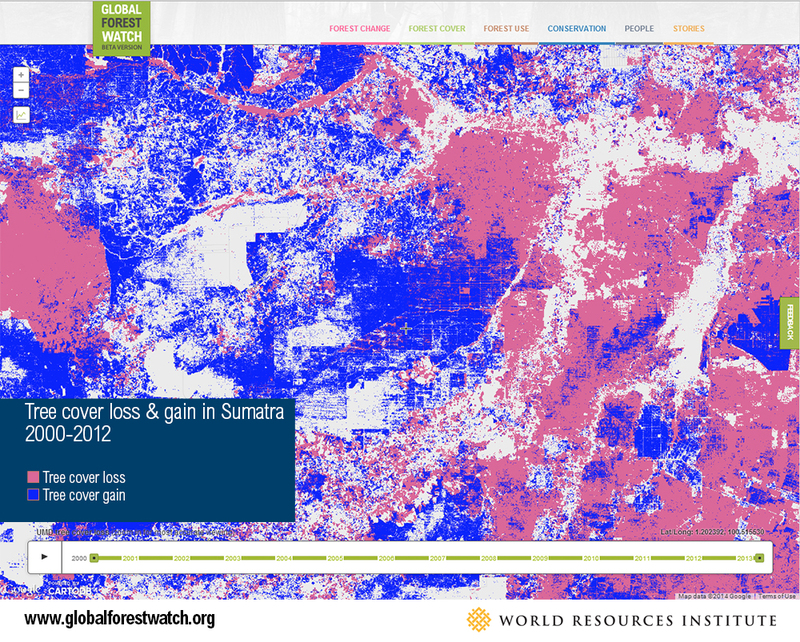 A snapshot from Global Forest Watch shows grid-like patterns of tree cover loss and gain in central Sumatra, indicating either displacement of natural forest by pulpwood and oil palm plantations or the cycles of regrowth in existing tree plantations. GFW is developing additional data to help indicate where plantations are located in key countries. The forest change layers featured on GFW involve different methodologies, including different approaches to validating results. While the methodologies are generally robust and peer-reviewed, we cannot always quantify their accuracy. If we spend months or years validating a dataset, it will be out-of-date before we even publish it. In other cases, datasets (particularly related to land use allocation) may have known accuracy problems but remain the best available information. Rather than not showing information of unknown or questionable accuracy, GFW is looking towards “the crowd” to help us validate and ground-truth our data. GFW users are encouraged to submit geo-referenced comments, photos, and videos and to use our forthcoming crowd validation app to check GFW alerts against the latest satellite imagery. GFW is far from providing a complete picture of the state of forest landscapes around the world. For example, we lack data on concessions for many countries, on community land rights and uses, on different forest types, and on infrastructure projects. While some of this data may exist, it may not be easily accessible, freely available, or readily shareable. GFW seeks to fill critical information gaps by working with partners to acquire and generate new datasets, and we need feedback from data users to identify the biggest needs, including for REDD+. In addition, through GFW’s open data policies, we hope to support a broader movement for increased data disclosure and transparency. 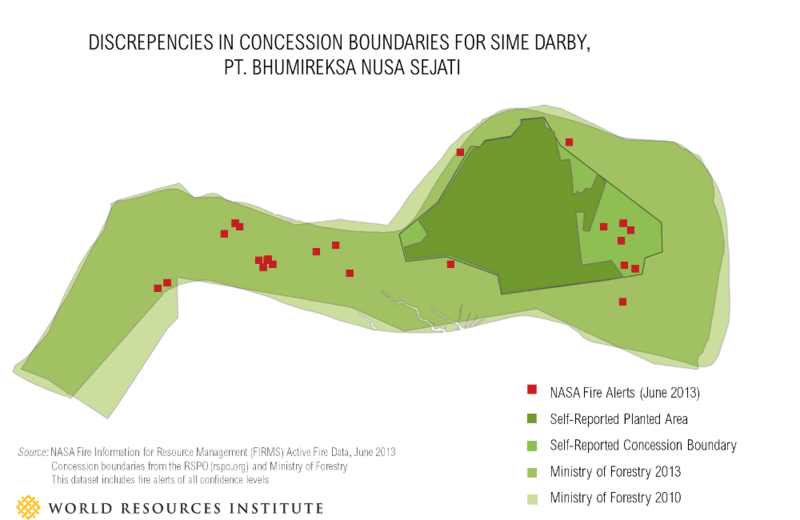 Discrepancies between concession boundary datasets from analysis on Indonesia’s June 2013 fires. Concession data is often difficult to access, hard-to-understand, or out-of-date for many regions. Information alone cannot lead to real-world change—it takes the work of communities, organizations, and other stakeholders to turn data into action. GFW therefore seeks to provide information in easily understandable, immediately actionable, and locally relevant formats. However, translating large, complex datasets into straightforward, policy-relevant information involves challenges and risks. Oversimplification of data can lead to misinterpretation and misuse. Rather than trying to present a single interpretation of a complex dataset, GFW is creating open data tools and APIs that will allow data to be applied and interpreted in customizable ways. Through open data policies, Global Forest Watch aims to facilitate a transparent dialogue about the state of forest information and broad participation in its generation, validation, and sharing. Together, we can improve the quality and accessibility of much needed information about forests and land use change, so that we can finally measure what we manage. We invite you to join the movement to overcome the forest information problem and make GFW a useful tool for policy-makers, decision-makers, and campaigners seeking to reduce deforestation and improve the livelihoods of forest-dependent communities around the world.